Lantastic! NZ-Aus -great way to travel! My much loved airline (Qantas) and my all time favourite plane: the Super Jumbo A380 - both tainted. Worse my favourite engine type, the Rolls Royce is in disgrace. Up to now, I had always felt safer flying with the best of British engineering. A Qantas flight powered by Rolls Royce? Mythically in my mind this meant creme de la creme! On November 4, this all changed. In a highly publicised incident, on that day, aircraft VH-OQA called Nancy Bird Walton, (which was in fact the first of Qantas' A380 s) took off from Singapore flying Qantas Flight 32 to Sydney, Australia. Four minutes into flight, at 10:01 am Singapore Time the plane's Number 2 engine had an "uncontained failure" with a turbine disk being released in the engine. The debris punched holes in part of the wing, damaged the fuel system disabled a hydraulic system, knocked out the anti-lock brakes, damaged landing flaps and wiped out the controls for the neighbouring engine )outer left No.1). 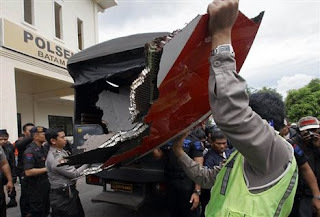 Part of the engine cowling fell onto the island of Batam (Indonesian island very close to Singapore) which led to media reports that the plane had crashed on Batam. The Airbus circled for over an hour attempting to dump fuel while the very experienced crew dealt with multiple checklists and reportedly 54 alarms (as luck would have it, there were five pilots in the cockpit with Captain, First Officer and Second Officer, plus two check captains. The first was performing an annual check on the Captain -hope he passed! The second check captain was evaluating the first check captain). The crew found that the fuel couldn’t be dumped. They also could not pump it between tanks. As it leaked out, the plane started to become harder to control as it grew tail-heavy. In the end the decision was made to land with more than 80 tonnes of highly volatile jet kerosene still in the 11 tanks -- two of which were leaking. The landing was back at Singapore's Changi Airport where the plane had started from.Without the full hydraulics, the spoilers - the flaps which slow the plane down - could not be deployed fully so the crew also had to rely on gravity for the undercarriage to lock into place. With only one engine able to deploy reverse thrust and no anti skid brakes, the landing took most of the 4km Changi runway. Four tyres were blown in the process. Even after landing the Number one engine would not shut down and it had to be doused by the fire crew until it flamed out. After the landing, both Qantas and Singapore Airlines grounded their A380s. Singapore resumed their flights the next day after tests. Qantas however found two engines on their other A380s that they had concerns with. Qantas kept their planes grounded stating they had found oil leaks that were "beyond normal tolerances". Singapore Airlines, announced that they planned to replace three engines on three separate planes, grounding the aircraft in question until the issues were resolved and Lufthansa announced the precautionary replacement of an engine on its A380. Emirates and Air France kept flying as their A380 engines are not made by Rolls Royce but by Engine Alliance (consortium between GE and Pratt & Whitney). After the incident, the fingers started pointing. Media, passengers and some Qantas staff blamed outsourced maintenance and cost cutting, Many worried that Qantas was losing its rain man status. (as detailed in an earlier blog post). Qantas suggested there was a design issue. Airbus pointed all questions to Rolls Royce. Rolls Royce has officially said nothing but they are replacing all of the engines that are suffering from oil leaks. Four days after the incident, EASA (The European Aviation Safety Agency) issued an Airworthiness Directive, ordering airlines using the Rolls Royce Trent 900 engine to conduct stringent tests frequently. The reversed some of those demands two weeks later. Rolls Royce had already had a highly publicised failure with its Trent 1000 engine designed for the 787. Qantas has now partially returned its fleet of A380s to service with two starting back. The rest of the fleet will remain grounded until 16 of the massive engines are replaced. No A380s will be used on flights between Los Angeles and Australia which require the highest amount of take off thrust. (I also wonder if the distance to an emergency airport may be too great on that sector). I had personally made a decision to wait two years before I flew in the A380 because I figured that the real world would provide the best tests of the safety of this plane. Seems I was almost right. Qantas launched the A380 with the tagline "World's Most Experienced Airline". On November 4, 2010, the crew showed the value and the reality of the statement. My next A380 flight? 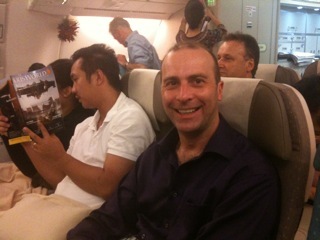 Singapore to Sydney with Singapore airlines (my second A380 with them). Wish me good luck with highly experienced crew.